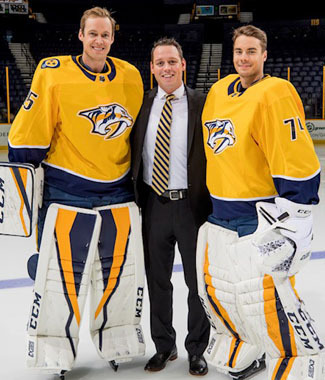 Ben Vanderklok is currently in his fifth season as the Goaltending Coach of the Nashville Predators, the 2017 Western Conference Champions and 2018 Presidents Trophy winner. 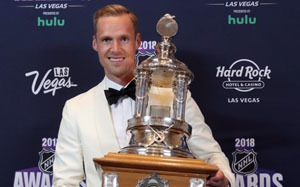 Over the last five years Ben has been the Goaltending Coach of Pekka Rinne, the 2018 Vezina Trophy winner and 4-time NHL All Star. Ben also works with Juuse Saros, franchise record holder of a 46 save shutout and member of the 2018 NHL All Rookie team. Previously, he spent 5 years as the Assistant Goaltending Coach of the Nashville Predators. In this position, his main responsibility was the Milwaukee Admirals (AHL) and the Cincinnati Cyclones (ECHL) teams. Prior to joining the Predators, he spent 6 seasons as the Head Goaltending Coach of the Niagara Ice Dogs (OHL) and as the Goaltending Coach for the Brock Badgers CIS University Hockey team. 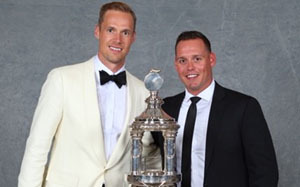 Throughout his coaching career Ben has worked to develop goaltenders that have went on to play successful Major Junior and Professional hockey careers. Ben was drafted to the Barrie Colts of the Ontario Hockey League and played 2 seasons with them after departing from the Ontario Hockey League, Ben signed a pro contract in Europe spending 4 seasons in Holland where he gained International playing experience with the Dutch National Team. This is the 16th year Ben has been running goalie camps throughout the Niagara Region. For our camps we employ only the best staffing the Niagara Region has to offer. We believe this is crucial in maintaining such a high-end program. All of our instructors are past students of Ben Vanderklok, which makes teaching consistent and allows your child to grasp the techniques much quicker. Ben excels at teaching the modern fundamentals of goaltending and is well known for his ability to take goaltenders to the next level. Ben Vanderklok Goaltending has a proven method for developing goaltenders to reach their maximum potential. Get the edge and join Ben Vanderklok today! Jason Barron has been with BVG now for the past 12 years. He began as a student of Ben’s and now is responsible for running all of our mini-rink, practice lesson and clinics throughout the Niagara Region. Jason is the Assistant Director of Player Development – Goaltenders for the Erie Otters (OHL), Goaltending Coach & Hockey Operations coordinator for Ridley College Prep Hockey, and former Goaltending Coach of Team OMHA – OHL Gold Cup U16. Rob Barnhardt has been with BVG since the beginning. He began 15 years ago as Ben’s assistant and has been a Head Instructor with BVG since. He is a former Goaltending Coach for Brock University CIS, and former Goaltending Coach for the Fort Erie Meteors Jr.B Hockey. Rob played for Potsdam University between 2004-2008 and is now a teacher with the DSBN.